Temperatures in the corona—the tenuous, outermost layer of the solar atmosphere—spike upwards of 2 million degrees Fahrenheit, while just 1,000 miles below, the underlying surface simmers at a balmy 10,000 F. How the Sun manages this feat remains one of the greatest unanswered questions in astrophysics; scientists call it the coronal heating problem. A new, landmark mission, NASA's Parker Solar Probe—scheduled to launch no earlier than Aug. 11, 2018—will fly through the corona itself, seeking clues to its behavior and offering the chance for scientists to solve this mystery. From Earth, as we see it in visible light, the Sun's appearance—quiet, unchanging—belies the life and drama of our nearest star. Its turbulent surface is rocked by eruptions and intense bursts of radiation, which hurl solar material at incredible speeds to every corner of the solar system. This solar activity can trigger space weather events that have the potential to disrupt radio communications, harm satellites and astronauts, and at their most severe, interfere with power grids. Above the surface, the corona extends for millions of miles and roils with plasma, gases superheated so much that they separate into an electric flow of ions and free electrons. Eventually, it continues outward as the solar wind, a supersonic stream of plasma permeating the entire solar system. And so, it is that humans live well within the extended atmosphere of our Sun. To fully understand the corona and all its secrets is to understand not only the star that powers life on Earth, but also, the very space around us. Most of what we know about the corona is deeply rooted in the history of total solar eclipses. 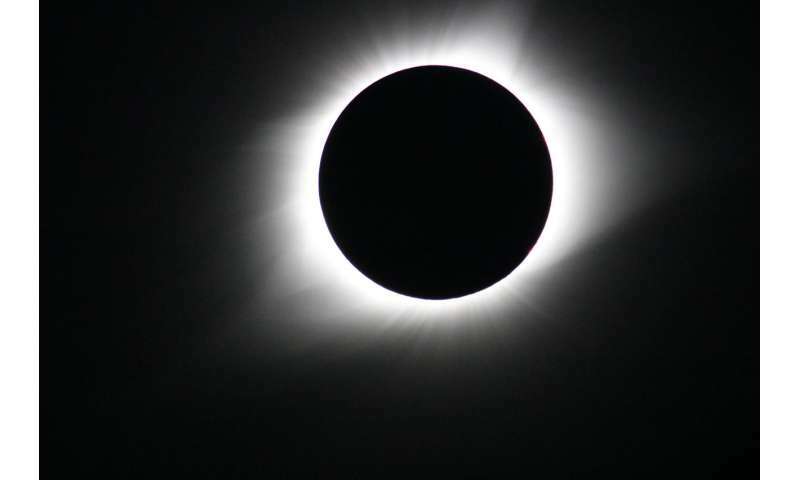 Before sophisticated instruments and spacecraft, the only way to study the corona from Earth was during a total eclipse, when the Moon blocks the Sun's bright face, revealing the surrounding, dimmer corona. The story of the coronal heating problem begins with a green spectral line observed during an 1869 total eclipse. Because different elements emit light at characteristic wavelengths, scientists can use spectrometers to analyze light from the Sun and identify its composition. But the green line observed in 1869 didn't correspond to any known elements on Earth. Scientists thought perhaps they'd discovered a new element, and they called it coronium. Not until 70 years later did a Swedish physicist discover the element responsible for the emission is iron, superheated to the point that it's ionized 13 times, leaving it with just half the electrons of a normal atom of iron. And therein lies the problem: Scientists calculated that such high levels of ionization would require coronal temperatures around 2 million degrees Fahrenheit—nearly 200 times hotter than the surface. For decades, this deceptively simple green line has been the Mona Lisa of solar science, baffling scientists who can't explain its existence. Since identifying its source, we've come to understand the puzzle is even more complex than it first appeared. "I think of the coronal heating problem as an umbrella that covers a couple of related confusing problems," said Justin Kasper, a space scientist at the University of Michigan in Ann Arbor. Kasper is also principal investigator for SWEAP, short for the Solar Wind Electrons Alphas and Protons Investigation, an instrument suite aboard Parker Solar Probe. "First, how does the corona get that hot that quickly? But the second part of the problem is that it doesn't just start, it keeps going. And not only does heating continue, but different elements are heated at different rates." It's an intriguing hint at what's going on with heating in the Sun. Since discovering the hot corona, scientists and engineers have done a great deal of work to understand its behavior. They've developed powerful models and instruments and launched spacecraft that watch the Sun around the clock. But even the most complex models and high-resolution observations can only partially explain coronal heating, and some theories contradict each other. There's also the problem of studying the corona from afar. We may live within the Sun's expansive atmosphere, but the corona and solar plasma in near-Earth space differ dramatically. It takes the slow solar wind around four days to travel 93 million miles and reach Earth or the spacecraft that study it—plenty of time for it to intermix with other particles zipping through space and lose its defining features. Studying this homogenous soup of plasma for clues to coronal heating is like trying to study the geology of a mountain, by sifting through sediment in a river delta thousands of miles downstream. By traveling to the corona, Parker Solar Probe will sample just-heated particles, removing the uncertainties of a 93-million-mile journey and sending back to Earth the most pristine measurements of the corona ever recorded. "All of our work over the years has culminated to this point: We realized we can never fully solve the coronal heating problem until we send a probe to make measurements in the corona itself," said Nour Raouafi, Parker Solar Probe deputy project scientist and solar physicist at the Johns Hopkins University Applied Physics Laboratory in Laurel, Maryland. Traveling to the Sun is an idea older than NASA itself, but it's taken decades to engineer the technology that makes its journey possible. In that time, scientists have determined exactly what kinds of data—and corresponding instruments—they need in order to complete a picture of the corona and answer this ultimate of burning questions. Parker Solar Probe will test two chief theories to explain coronal heating. The outer layers of the Sun are constantly boiling and roil with mechanical energy. As massive cells of charged plasma churn through the Sun—much the way distinct bubbles roll up through a pot of boiling water—their fluid motion generates complex magnetic fields that extend far up into the corona. Somehow, the tangled fields channel this ferocious energy into the corona as heat—how they do so is what each theory attempts to explain. One theory proposes electromagnetic waves are the root of the corona's extreme heat. Perhaps that boiling motion launches magnetic waves of a certain frequency—called Alfvén waves—from deep within the Sun out into the corona, which send charged particles spinning and heat the atmosphere, a bit like how ocean waves push and accelerate surfers toward the shore. Another suggests bomb-like explosions, called nanoflares, across the Sun's surface dump heat into the solar atmosphere. Like their larger counterparts, solar flares, nanoflares are thought to result from an explosive process called magnetic reconnection. Turbulent boiling on the Sun twists and contorts magnetic field lines, building up stress and tension until they explosively snap—like breaking an over-wound rubber band—accelerating and heating particles in their wake. The two theories aren't necessarily mutually exclusive. In fact, to complicate matters, many scientists think both may be involved in heating the corona. Sometimes, for example, the magnetic reconnection that sets off a nanoflare could also launch Alfvén waves, which then further heat surrounding plasma. The other big question is, how often do these processes happen—constantly or in distinct bursts? Answering that requires a level of detail we don't have from 93 million miles away. "We're going close to the heating, and there are times Parker Solar Probe will co-rotate, or orbit the Sun at the same speed the Sun itself rotates," said Eric Christian, a space scientist at NASA's Goddard Space Flight Center in Greenbelt, Maryland, and member of the mission's science team. "That's an important part of the science. By hovering over the same spot, we'll see the evolution of heating." Once Parker Solar Probe arrives at the corona, how will it help scientists distinguish whether waves or nanoflares drive heating? While the spacecraft carries four instrument suites for a variety of types of research, two in particular will obtain data useful for solving the coronal heating mystery: the FIELDS experiment and SWEAP. Surveyor of invisible forces, FIELDS, led by the University of California, Berkeley, directly measures electric and magnetic fields, in order to understand the shocks, waves and magnetic reconnection events that heat the solar wind. SWEAP—led by the Harvard-Smithsonian Astrophysical Observatory in Cambridge, Massachusetts—is the complementary half of the investigation, gathering data on the hot plasma itself. It counts the most abundant particles in the solar wind—electrons, protons and helium ions—and measures their temperature, how fast they're moving after they've been heated, and in what direction. Together, the two instrument suites paint a picture of the electromagnetic fields thought to be responsible for heating, as well as the just-heated solar particles swirling through the corona. Key to their success are high-resolution measurements, capable of resolving interactions between waves and particles at mere fractions of a second. Parker Solar Probe will swoop within 3.9 million miles of the Sun's surface—and while this distance may seem great, the spacecraft is well-positioned to detect signatures of coronal heating. "Even though magnetic reconnection events take place lower down near the Sun's surface, the spacecraft will see the plasma right after they occur," said Goddard solar scientist Nicholeen Viall. "We have a chance to stick our thermometer right in the corona and watch the temperature rise. Compare that to studying plasma that was heated four days ago from Earth, where a lot of the 3-D structures and time-sensitive information are washed out." This part of the corona is entirely unexplored territory, and scientists expect sights unlike anything they've seen before. Some think the plasma there will be wispy and tenuous, like cirrus clouds. Or perhaps it will appear like massive pipe cleaner-like structures radiating from the Sun. "I'm pretty sure when we get that first round of data back, we'll see the solar wind at lower altitudes near the Sun is spiky and impulsive," said Stuart Bale, University of California, Berkeley, astrophysicist and FIELDS principal investigator. "I'd lay my money on the data being much more exciting than what we see near Earth." The data is complicated enough—and comes from multiple instruments—that it will take scientists some time to piece together an explanation for coronal heating. And because the Sun's surface isn't smooth and varies throughout, Parker Solar Probe needs to make multiple passes over the Sun to tell the whole story. But scientists are confident it has the tools to answer their questions. The basic idea is that each proposed mechanism for heating has its own distinct signature. If Alfvén waves are the source of the corona's extreme heat, FIELDS will detect their activity. Since heavier ions are heated at different rates, it appears that different classes of particles interact with those waves in specific ways; SWEAP will characterize their unique interactions. If nanoflares are responsible, scientists expect to see jets of accelerated particles shooting out in opposite directions—a telltale sign of explosive magnetic reconnection. Where magnetic reconnection occurs, they should also detect hot spots where magnetic fields are rapidly changing and heating the surrounding plasma. There is an eagerness and excitement buzzing among solar scientists: Parker Solar Probe's mission marks a watershed moment in the history of astrophysics, and they have a real chance of unraveling the mysteries that have confounded their field for nearly 150 years. By piecing together the inner workings of the corona, scientists will reach a deeper understanding of the dynamics that spark space weather events, shaping conditions in near-Earth space. But the applications of this science extend beyond the solar system too. The Sun opens a window into understanding other stars—especially those that also exhibit Sun-like heating—stars that could potentially foster habitable environments but are too far to ever study. And illuminating the fundamental physics of plasmas could likely teach scientists a great deal about how plasmas behave elsewhere in the universe, like in clusters of galaxies or around black holes. It's also entirely possible that we haven't even conceived of the greatest discoveries to come. It's hard to predict how solving coronal heating will shift our understanding of the space around us, but fundamental discoveries such as this have the capacity to change science and technology forever. Parker Solar Probe's journey takes human curiosity to a never-before-seen region of the solar system, where every observation is a potential discovery. "I'm almost certain we'll discover new phenomena we don't know anything about now, and that's very exciting for us," Raouafi said. 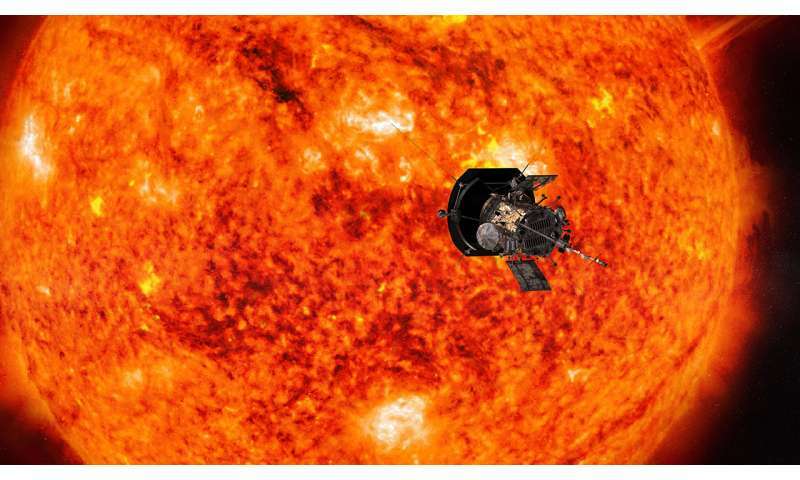 "Parker Solar Probe will make history by helping us understand coronal heating—as well as solar wind acceleration and solar energetic particles—but I think it also has the potential to steer the direction of solar physics' future." "Scientists calculated that such high levels of ionization would require coronal temperatures around 2 million degrees Fahrenheit—nearly 200 times hotter than the surface." How strong an electric field would be required to do the same? Why don't you tell us? Having figured it out. then tell us which way the ions and electrons travel in this field, and which way they are actually observed to travel. Operating under the idea that chaotically tangled magnetic field lines exist throughout astrophysical plasmas, the team used high-performance computer simulation to gain an understanding of these chaotic field lines. Specifically, they investigated conditions that create ribbons of intense electric current, known as current sheets. The current sheets, believed to be produced in the coronal plasma, are potential sites for magnetic reconnections, which provide a mechanism for extreme heating of the corona. Moreover, within the current sheets, the electric field peaks up and accelerates charged particles. Indeed. However, I think you'll find that Solon, and the rest of the EU crew, don't believe in magnetic reconnection. Despite it being demonstrated in laboratories, and observed in-situ countless times. In their fantasy world, the Sun is a giant lightbulb, powered by an invisible, undetectable incoming current. My model is not in keeping with the Thunderbolts model in many respects. I do believe in magnetic reconnection, but it is the terminology that is confusing. The Sun in my model is capable of creating electric fields that go beyond the Schwinger limit, but we can not as yet produce those energies in the lab to be able to perform experiments. By magnetic confinement and charge accumulation the Sun can create ions up to iron, and as with the proton, they will accelerate away from the Sun when they breach confinement, iron accelerating the fastest, a proposal that goes as far back as the ancient Greeks, and is confirmed by data from observations of what mainstream calls a supernova, but which I believe are really failures of the spherical double layers that are present within the Sun. The outer double layer is the weakest, and protons escape quite easily. The Thunderbolts woo pales in comparison to mine. the EU crew, don't believe in magnetic reconnection. That's correct, the EU relies on real science and not the pseudoscientific mumbo jumbo of MRx. Really? Since when? Tell us where the real science is in the electric comet; or the electric sun; or Venus hurtling out of Jupiter; or Earth formerly orbiting Saturn; or habitable planets within the atmospheres of brown dwarves. Just for starters. Sorry, it relies purely on mythology. .......what mainstream calls a supernova, but which I believe are really failures of the spherical double layers that are present within the Sun. In your model, where are the neutrinos in supernovae, and from our own star, coming from? We know of only one way to create neutrinos, and there are sufficient of them to show that the Sun is powered solely by fusion. .....failures of the spherical double layers that are present within the Sun. The Sun is far too turbulent a place to have DLs lasting for any length of time. In particular, 'within' it. The outer zone is convective, as observed, and there is no way a star encircling DL could form. Not in any plasma physics I've ever read, anyway. "In your model, where are the neutrinos in supernovae, and from our own star, coming from?" Nope. There are, inconveniently, sufficient neutrinos to precisely match the amount of nuclear fusion estimated to be happening in the Sun. How is your mechanism magically matching this number? What are the energies of the produced neutrinos in this so-called mechanism? Does it match observation? Aren't electron anti-neutrinos produced in this process? Where are they? I'm sorry, but there is absolutely nothing in the standard model of the Sun that requires it to be thrown out in favour of some ill defined alternative. The Electric Sun is real. It was formed by Uli John Roth after he left the Scorpions in 1978. The Scorpions? They were Germans, weren't they? The buggers bombed my Granny. The Sun is far too turbulent a place to have DLs lasting for any length of time. This is a completely false assumption based in nothing. If there is so much "turbulence" then how is there so much structure at every level. And how do the cells of the photospheric granules remain coherent as long as they do? "Nope. There are, inconveniently, sufficient neutrinos to precisely match the amount of nuclear fusion estimated to be happening in the Sun." Estimated? Is that science? The standard model relies on many assumptions, so why shouldn;t I? Light is the primary energy source, but the light in the case of the Sun is hard gamma, and it is generated by what I would call magnetic reconnection, which is 'sparking the vacuum'. Err, what are you talking about? Where are these DLs? What are they supposed to be doing? Why do we need them? Wrong. How do you think we knew that there was a neutrino deficit? Because the amount predicted was not measured. Now it is. As are the energy levels. I asked you about that. What are they, and where are the electron anti-neutrinos? Stop making crap up, and show us the science. jonesdumb displays his typical tactics, dodge, duck, dive and dodge... And also displays his utter ignorance of plasma physics and the ubiquitous double layer discovered by Langmuir almost one hundred years ago. "..and where are the electron anti-neutrinos?" "Four experiments have demonstrated new levels of sensitivity to neutrinoless double-beta decay, a process whose existence would prove that neutrinos are their own antiparticles." Hey thicko, I asked a question, which requires some scientific explanation. If it is beyond you, you loon, just say so. Haven't got an answer, have you, woo boy? Lol. Give up you divvy. Science really isn't your thing, is it? What are the energies, and where the **** are they? Answer, woo child. Stop making sh1t up. Did you learn that from the idiots Thornhill and Talbott? All woo and word salad; zero science? Just give up mate, because you are horribly out of your depth, along with the idiot cantthink. Go away and read something you might understand, such as Velikovsky. Lol. Stay away from science, yes? Het, sh1t for brains, we can tell the frigging difference between a neutrino and an anti-neutrino, dummy. And guess what we don't see from the Sun? Idiot. How thick are you people? Has any one of you got past primary (grade) school science? I don't think you realise how stupid you make yourselves look, eh? Ignorance is bliss in the EU camp, yes? Can't do science, can't do maths. In which case we can believe in anything. Yey! Dumb arses. Go back to school. No it isn't you idiot. We would detect that, you prawn. We would be bloody dead if it was, you cretin. How thick are you people? Seriously? How scientifically ignorant do you need to be to follow this EU crap? Stop making sh1t up, and do some science, woo boys. Yes? Estimated? Is that science? The standard model relies on many assumptions, so why shouldn;t I? Yes, estimated, woo boy. We know how much energy the Sun is giving off. Do you know why that is, woo child? And then we can work out how much %^&*ing fusion that requires from the p-p chain. Understand? Thought not. From that, we can work out how many %^&$ing neutrinos ought to be produced per second. Comprende, thicko? Nah, course not. Guess what is measured? Christ you people are thick. I always wondered how Asperger Syndrome would exhibit itself in print. As I pointed out, you display the four D's of dodgeball, dodge, duck, dive, and dodge. There are a couple questions in my comment you so conveniently answered with your usual childish name calling and diversion. Because they're 1000 miles across. So, no answers then? As expected. And I've known for some time what scientific illiteracy looks like in print - just following posts by the likes of you and cantthink, or a trip over to Dunderdolts, will show that. Still no answer from jonesdumb. And barkn interjects with a non-answer. The comment was that the Sun was too turbulent to allow for DL's to exist. Yet, here are these 1000 mile across granules which remain coherent in all this turbulence. How? What are these granules separated by? Why does jonesdumb continue to ignore the questions? "I always wondered how Asperger Syndrome would exhibit itself in print." Because it is a non-starter. Why do we need DLs? What are they doing? What is their relevance to anything we know about the Sun? Dodge, duck, dive, and dodge....with a twist of willful ignorance. Sorry, woo boy? Where are these DLs proposed? You know, in the scientific literature, by someone who understands science? Tell me that, and I'll go read up on it. If you can't do that, you are just making crap up, and there is nothing to address. Where are these DLs proposed? You should start with Langmuir's papers from the '20's regarding naturally occurring surface layers that arise in plasmas. Then you should open your eyes to see the granules are coherent, with darker filaments separating them. With this knowledge established by Langmuir almost one hundred years ago and the obvious visual clues one can deduce that your claims are bupkis as usual. Langmuir never proposed DLs on the surface of the Sun. Please point me to someone who has, otherwise there is nothing to discuss, is there? They have 8 to 20 minute lifespans. Considering that some 1000 mile wide asteroids have been around for over 4 billion years, that's pretty short. You keep throwing the word 'coherent' around like it's some sort of magic. A bubble rising in a boiling pot of water is briefly coherent, but it's merely evidence that the water is boiling, not that there's magic DLs in it or that boiling water isn't extremely turbulent. are you avoiding it or just incapable of answering? PS - so far you've demonstrated one problem seen in a lot of pseudoscience advocates: You're presenting your interpretations of the physics while linking data that you think supports your claims"
We can not have a legit conversation if you are not willing to even consider models of the Sun that are outside of that which is presently considered to be fact, but which in reality is only speculation. I have linked to a couple of articles that COULD be used to support an alternative model, can you provide links to papers that prove beyond a reasonable doubt that the Sun could NOT be anything other than what the standard model proposes? Hopefully the Parker probe will be able to answer some basic questions, though it seems that often many missions only create more questions than they answer. Langmuir found that DL's naturally occur between two plasmas with different properties, even if the difference is slight. They are ubiquitous in laboratory plasmas, the assumption should be the opposite of yours and assume they are there unless it can be shown they don't exist. Problem is that MHD models are religiously used and those models cannot resolve these phenomena so it is assumed they are not there. This is one of the many problems with allowing maths to lead science discoveries, maths is very often misleading and has little to nothing to do with reality. how does one check your argument if there is no baseline or model reference and only your word that it's applicable? how can I (or anyone else) check your facts if you just state "an" alternative model? can you provide links to papers that prove beyond a reasonable doubt that the Sun could NOT be anything other than what the standard model proposes? can you provide links to papers that prove that unicorn farts aren't the cause of hurricanes? Tell Alfven - he said it was fine to use MHD in the photosphere. Want the links? I very much doubt anybody involved with EU understands enough plasma physics to describe whatever it is you are proposing - so it is a moot point. Show me the literature. No, you haven't. I think you forget how much evidence there is to back up the standard solar model. There is no room for alternate hypotheses. Those days are long gone. Short of working with different laws of physics than the rest of us, the basic tenets of the standard model are indisputable. Which is why they aren't disputed. Except by the odd crank. ......in other words, there is not a snowballs chance in the photosphere of overturning the standard model. And nobody is trying to. It is extremely successful. The only people apparently in disagreement are a bunch of mythologists, who believe in all sorts of nonsense, and can therefore be safely ignored. If you believe otherwise, then not only are you going to need to come up with a model that matches observation, but also has valid alternative explanations for what we already see in favour of the standard model. The chances of that? None. jonesdumb continues to dodge, duck, dive, and dodge. Still no compelling reason why DL's are impossible on the Sun. He insists that plasma physics is different everywhere else in the Universe than on Earth. Earth must be special to accommodate all these special plasma physics. There is no room for alternate hypotheses. Those days are long gone. Short of working with different laws of physics than the rest of us, the basic tenets of the standard model are indisputable. LOL, that's religion for you. Please point to any successful predictions of Eddington's solar model. It is an utter failure from the start, the presence of the corona is just one example of this completely useless model. So, where is the science? are we just supposed to take your word that it's legit? where is the testable anything? which is no different than what any crazy man would also claim, mind you! The scientific approach has more things in common with religion than one would want to admit. yet another claim without evidence? are we supposed to "see" this just like you see it? religion, however, requires one suspend reality and just believe the "Authority"
you know, like saying "I'm just foreseeing this trend in physics of the last decade"
if you're correct, like with overunity, you'll get rich! and their interaction with electrons. need I reiterate that your personal reddit page isn't validation, let alone science? If you would bother at least to visit the abstracts, you would see, that most of links there actually favors hydrino theory. other than speculation, what is there? nor has it "withstood rigorous scrutiny and embody scientific knowledge"
!- how many times do I have to remind you that I am not going to click your pseudoscience reddit page? or didn't you catch that part of the link re: scientific theory? If you would bother at least to visit the abstracts, you would see, that most of links there actually favors hydrino theory. Randall Mills model is fully fledged theory in scientific sense, providing dozens of quantitative testable predictions (which is something, which for example so-called string "theory" is still sadly lacking). Of course this still doesn't mean, that this theory is correct (the case of epicycle model, which also brought valid quantitative predictions comes on mind here). Mate, Randell Mills is a con-artist. End of story. Hey, thicko? Guess what, you wa**er? We use a different f**&^ng model now, s^&t for brains. Yes? Remember the 19th century, do you, idiot? Well. it's gone now, dear. Can we please see the models of the scientifically illiterate EU loons? Otherwise, chaps, why don't you STFU? Yes? Science really isn't your thing, is it dears? Lol. ... the presence of the corona is just one example of this completely useless model. Yet another example of how thick these idiots really are! Eh, cantthink? Leave the science alone, dear, it is well beyond you, isn't it love? Lol. Well... I'm late to the party... gladly so by reading the amount hypocritical ignorance and unscientific bias and scepticism surrounding the topic! And when it comes to be being a scam... YOU AIN'T SCAMMING THE CIA AND GETTING AWAY WITH IT ANY TIME SOON!